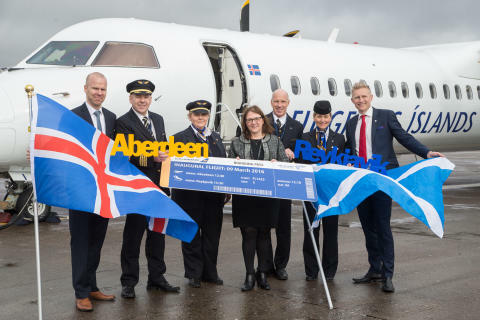 Yesterday, 9th March 2016, Icelandair started a new year-round service from Aberdeen International Airport (ABZ) to Reykjavik (KEF).The new gateway will become Icelandair’s second in Scotland and sixth in the UK. Flights will operate four times weekly on Mondays, Wednesdays, Fridays and Sundays. The flight to Reykjavik (KEF) will provide easy connections to Icelandair’s 16 gateways in North America and reduce current travel times by up to several hours. Icelandair destinations in North America include New York, Orlando, Seattle, Toronto and recently announced Chicago starting on 16th March and Montreal on 19th May. “It was a pleasure to be able to announce Aberdeen in the same year we celebrated 70 years of flying to Scotland. We see great opportunities in connecting this market to our route network of North American destinations. Travel times will be shortened and we’re confident customers will appreciate the easy connections through our hub in Iceland”. “We are very excited about the arrival of Icelandair at Aberdeen and we’re confident that the new service is going to be incredibly popular, both amongst our leisure and our business travellers. Aberdeen is also an enticing destination for the North American market, and this new route opens up new links to cities such as New York, Toronto and Chicago. “It is fantastic to see this important new service get underway today and I congratulate everyone involved in getting it off the ground. “As well as being the gateway to Iceland, Keflavik is also an important hub airport offering onward travel to a wide selection of destinations, including the United States of America and Canada. The business community in Aberdeen and the North East is sure to benefit from improved access to international markets and this new link will no doubt prove popular with tourists too. “Following devolution of powers over Air Passenger Duty (APD) to the Scottish Parliament, we will look to attract more direct services to Scotland’s airports by beginning to reduce the burden of APD by 50% from April 2018, and abolishing it entirely when public finances allow. “This new route is fantastic news for tourism in Aberdeen and adds to the burgeoning number of direct international flights to Scotland, which is key to growing the visitor economy. 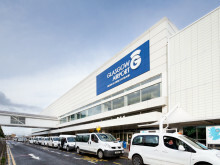 “Our North American friends continue to be our biggest international inbound visitor market with more than half of visitors attracted to Scotland by its awe-inspiring scenery, such as the beautiful Royal Deeside, while the proposed new AECC will further enhance business tourism opportunities. “Businesses in Aberdeen will welcome the exciting news that the city has a new carrier and this investment by Icelandair shows confidence in the region. “Our connections to global markets are vital to the continuing prosperity of the North-east with many businesses looking to grow through their international activities. These new routes to North America will help them access new markets in which to do business. The new Aberdeen-Reykjavik service is operated on behalf of Icelandair by Air Iceland, a subsidiary of Icelandair Group. The aircraft used is a Bombardier Q400 that seats 72 passengers and offers passengers two cabins of travel to choose from, Economy and Economy Comfort. Icelandair’s geographic position on the shortest flight path between UK and North America means it offers the quickest route to many of the existing 16 gateways they fly to. Currently Icelandair fly from Heathrow, Gatwick, Manchester, Birmingham and Glasgow airports via Iceland to Anchorage, Vancouver, Edmonton, Seattle, Portland, Denver, Minneapolis, Toronto, Orlando, Washington DC, New York (JFK & Newark), Boston, Halifax, Chicago and Montreal. Icelandair bagan flights from Aberdeen airport on 9th March 2015 operated by sister airline Air Iceland. Only Icelandair allows passengers to take an Icelandair Stopover for up to seven nights at no additional airfare.